A nickname for Boston is The Athens of America, used mainly in literary circles during the first half of the 20th Century. The origin is believed to be in a letter written in 1764 by Samuel Adams, as quoted in History of the United States, by George Bancroft, Volume 5, page 195 (1857), in which Adams wrote "Boston might become a Christian Sparta." Also, in 1819, William Tudor wrote a letter describing the town: "[Boston] is perhaps the most perfect and certainly the best-regulated democracy that ever existed. There is something so impossible in the immortal fame of Athens, that the very name makes everything modern shrink from comparison; but since the days of that glorious city I know of none that has approached so near in some points, distant as it may still be from that illustrious model." 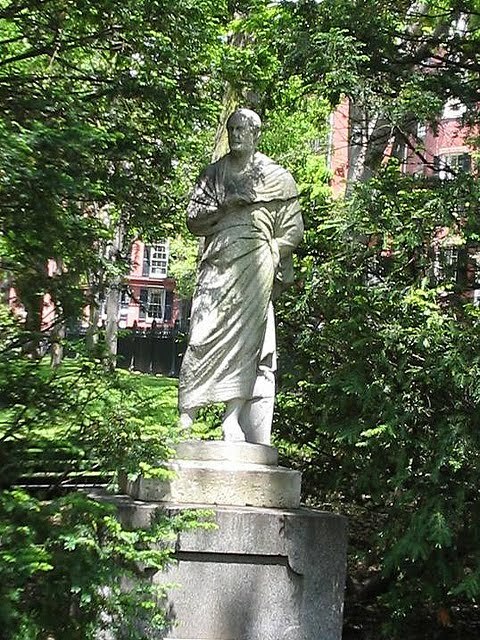 On the western slope of Beacon Hill, at Louisburg Square, is a statue of Ancient Greek general and statesman Aristides the Just (530?-468 BC). Aristides led the army in a great victory over the Persians at the Battle of Plataea (479). In 478, he was a prominent leader in the formation of the confederacy of Greek city-states known as the Delian League. The Aristides statue on Beacon Hill was a significant symbol of the Athens of America alias, and also of 1850s Brahmin culture. Louisburg Square is collectively owned by a group of wealthy Boston residents. Joseph Iasigi, of Greek descent and one of the owners of the square, received approval in 1852 and installed the statue of Aristides. The square also hosts a statue of Christopher Columbus, installed about the same time, located at the opposite end as Aristides. In the early 1900s, a club of engineering and technology students resided at a building in the square, and Aristides became known as Uncle Louisburg or just Uncle Louie by the younger generations. Many of the quaint row houses and streets on Beacon Hill resemble parts of old London. This was of course, by design. According to the book Some Statues of Boston (1946), by State Street Trust Company, a former resident recalled that the Edison Company had at one time taken photographs of Louisburg Square, and thus avoided the need to travel to London to take photographs. Edinburgh in Scotland was also known as a Modern Athens at about the same time Boston was espousing its similarity with the ancient Greek city.